On WordPress.tv, you’ll find tutorials for both WordPress self-installs and WordPress.com to help you get blogging fast and hassle-free. We’ve kicked things off with the basics — now you can shape what comes next. Just drop us a line and let us know what you’d like to see added. WordPress.tv is also now the place to find all that awesome WordCamp footage that was floating around the web without a home. See the presentations you missed and get a peek at behind-the-scenes action. We call it WordCampTV. You’ll also find slideshows of presentations made by WordPress gurus, plus interviews I’ve done with the media and fellow bloggers. I hope you’ll consider WordPress.tv not just a support resource, but also a place to hang out and keep up with all the geeky goodness going on in the WordPress community. 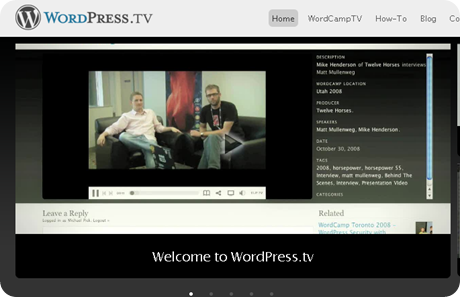 Tune in regularly for fresh content and updates to the WordPress.tv blog. Lots more is on the way. So I think this is good enough for beginners and lazy blogger’s 🙂 because you don’t have to read and understand the jargons of WordPress but rather watch and understand. I think this will be really helpful to newbie since they can easily understand those technicalities that it is hard for me to understand before. Since it is also a place where we can see footage from WordCamps all over the world, it will help us be informed in the latest information and the future news about WordPress. So what do you think are you thinking YourDomain.tv and start Video Blogging :). For me it will still take time. Thanks man Keep up the great posts. I think this is a very good innovation on wordpress. I am interstting in trying, but I think it needs big bandwith for streaming audio video, isn’t it ? It is for them. We can only view WordPress.tv , We may do the same in our own blog but yes it will need a larger bandwidth.